Something bad happened and now Mailtraq has issues. Maybe it is stalled, or is constantly turning on and off. This page explains how to fix those problems. Mailtraq writes serious problems it encounters to the Event Log. Examining the Event Log is the first step to resolving problems that you might have. Just in case, it means you can easily get back to your current situation. Mailtraq presents a live, rolling view of the Event Log in the Console, and also from the Monitor at the icon in the System Tray (on the Desktop, down by the clock). This live view is very useful for monitoring transactions, but when Mailtraq starts, the Event Log is empty and, to conserve memory, the data in the event log rolls off after approximately 700 lines. So it is less useful in diagnosing an underlying intermittent problem. Mailtraq also writes a semi-permanent record of all Mailtraq activity to file in real time. Mailtraq writes one file per day in the format LOG_31.TXT, over-written on a monthly cycle. The file name corresponding to the day of the month. The log files are simple text files and can be opened and examined in Notepad, or any other simple text viewer. We recommend not opening them in MS Word, or other 'word processing' software as you may impose unwanted formatting on the data that will make analysis harder. Each exception to normal events is flagged with that word, and a brief description of the event. Finding a single Exception in the log does not necessarily mean there is a problem. Mailtraq may just have hit a resource limit and then resolved the issue. Seeing several Exceptions or more indicates that you should investigate further. If Mailtraq encounters too many exceptions then it will stop and attempt to restart. If you find Mailtraq 'cycling' on and off this is the most likely cause. Any Exception referencing a 'username.afx' indicates corruption in that mailbox file. then that indicates the mailbox DB database file for jdoe (John Doe) has a corruption issue. then that indicates the mailbox DB database file for jsmith (John Smith) has a corruption issue. that indicates that the Message Tracker has become corrupted. It is easily rectified. Stop Mailtraq - locate the msgtrack.db file from the Mailtraq Database, and delete it. Restart Mailtraq. Mailtraq will automatically recreate the db file. Symptom: Mailtraq is running but the services are not responding - no mail is being received or can be sent. The limit referred to is usually RAM, but it could be CPU or Disk Access Speed - examining the Windows resource monitors will indicate which limit was reached. Mailtraq will attempt to automatically restart, however Windows security interlocks may prevent Mailtraq from restarting the services, or the service may be so busy that it cannot disconnect. Mailtraq will be running but services will be stopped, and not responsive. Rebooting the server will correct the issue. In a stable running system you should not expect to hit a Resource Limit. If you hit a Resource Limit on a newly commissioned system it most likely indicates that the hardware is undersized for the volume of mail, users, mailboxes or IMAP folders. The most likely cause is some type of 'mail event' where Mailtraq is flooded with tens of thousands of inbound messages in a very short period of time, in effect exhausting the RAM resources of the server. The most likely reason for such an event is Mailtraq having become an Open Relay or is under a DDoS attack. You can resolve an Open Relay like this... You can mitigate a Denial of Service attack by examining the logs on disk and identifying the inbound IP address connections and blocking them at your network firewall/router. Mailtraq has an internal Mailing List engine of its own that manages very large mailings however, if you have an external mailing list system or other similar email process (e.g. a billing system) that periodically uses Mailtraq as an SMTP relay you may need to throttle or limit the number of messages per hour that the external application sends to balance the available machine resources. Mailtraq does not have an inbound message throttle. What generally causes Corruption Exceptions? The most common cause of corrupted mailboxes and exceptions is abrupt power failure without shutdown, followed by wrongly set-up Anti-Virus and/or backup software. 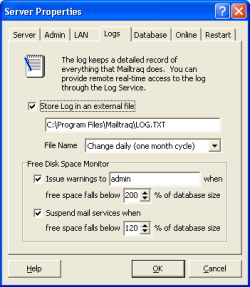 Each exception that Mailtraq encounters and logs is also entered into a special exceptions log. This is also a simple text file. Entries are appended to this file, so the most recent event is at the bottom. Examining the exc entry for an 'exception' will give more details. If you are encountering 'exceptions' that you do not understand and cannot resolve yourself, you can get help from Support. They will ask you to send them an extract of the Event Log showing examples of the exception, together with the matching entries from the exc file. You must have valid Upgrade Protection to receive individual support of this nature. You can check on your support status in the About dialog and if necessary you can Renew your Upgrade Protection.